Provide comfort for the family of Donna Dameron with a meaningful gesture of sympathy. 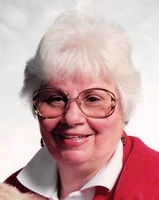 Donna "Sue" Dameron, 82, of Bloomington passed away Thursday, April 11, 2019 at Garden Villa in Bloomington. Born, November 2, 1936 in Monroe County, she was the daughter of the late Charles and Catherine (Harding) Roby. Sue was the first secretary for the Perry Township Fire Department, and she also provided clerical assistance at RCA, and the Monroe County Community School Corporation. She was a loving mother, grandmother, and sister who enjoyed gardening and crafts. She was a member of the Clear Creek Christian Church. Survivors include one son, Marty Dixon (Jolene), two grandsons, Tyler and Jake Dixon all of Bloomington, two sisters Gail Roby Smith of Mooresville and Connie Kottlowski (John) of New Palestine. Sue was preceded in death by her daughter, Sebrina Dixon, and husbands, Dale Myers, and Kenneth Dameron. Funeral services will be 11:00am Tuesday, April 16, 2019 at The Funeral Chapel of Powell and Deckard, 3000 E. Third St. in Bloomington. David Lee will officiate. Visitation will be 5-7pm Monday and one hour prior to the service on Tuesday at The Funeral Chapel. Burial will be at Mt. Gilead Cemetery. Memorial contributions may be made to the Clear Creek Christian Church, 530 W. Church Lane, Bloomington, IN 47403.